then it continued with more muted colours: Aster pyrenaeus ‚Lutetia‘, Dahlia ‚David Howard and Pennisetum alopecuroides ‚Moudry’… Fuchsia ‚Schwarzer Ritter‘ (Black Knight), an unknown, compact Hebe which is flowering almost all year and the stunning foliage of Melia azederach, the Persian lilac. Fuchsia ‚Schwarzer Ritter‘, eine unbekannte, kompakte Strauchveronika (Hebe), die fast das ganze Jahr blüht und die tolle Herbstfärbung von Melia azederach. Und jetzt ziehen wir nochmals alle Register: Liquidamber styraciflua, Cercis canadensis ‚Forest Pansy‘ und Pistacia sinensis. And now we finally paint the town red (or the countryside rather! ): Liquidamber styraciflua, Cercis canadensis ‚Forest Pansy‘ and Pistacia sinensis. Die Seerosen mögen bald auf dem Trockenen liegen, aber wenigsten schwimmen die Dahlien noch! Euch allen einen frohen Montag und eine gute Woche. Schaut bei Cathy vorbei und lasst euch von den Vasen der anderen Blogger inspirieren. The water lilies may soon be on dry land but my dahlias are still swimming! Happy Monday and a great week to you all. Pop over to Cathy and be inspired by the vases of my fellow bloggers. Weiter In a Vase on a Monday: All dried up! Amazing that you still have dahlias, Annette. I love your list of favorites, beautiful blazes of color as we slip into the dull colors of late fall (November is such a dreary month here). Hope you get a replenishing rain soon. Ha, I say that about February, too! Thanks for sharing some of your autumnal blooms, Annette, and allowing your dahlias to have a swim as I am sure you and Monsiuer will have abandoned it for this year. That spiky red dahlia looks interesting – does it have name? A lovely post Annette and thanks for giving us your Top Ten Blooms. I particularly love your rudbeckias. You have beautiful red autumn colour and your dahlia water lilies are gorgeous. Thank you, Liz, I’m especially fond of orange and velvety red dahlias. The Rudbeckias really made the borders glow this year. I love rudbeckias, I’m going to grow more next year. Despite the dry conditions, your garden still looks smashing, Annette. My own dahlias have been pulled and put to bed until next year. We’ve had just the barest touch of rain thus far, which isn’t auspicious for the start of our rainy season but then last year the pundits predicted low rainfall and they were wrong so I remain hopeful. I hope you get some soon too. Poor frogs! Das sind sooooo wunderschöne Fotos und Farben. Wunderschön anzusehen, Annette. Hier hat alles nur gegammelt, weil,es so naß war und ist. Da kann ich dir gut die Hälfte abgeben und versinke immer noch im Matsch. Jetzt wird es frostig und ich hoffe, damit auch etwas trockener. Das beschreibt die Situation sehr gut! 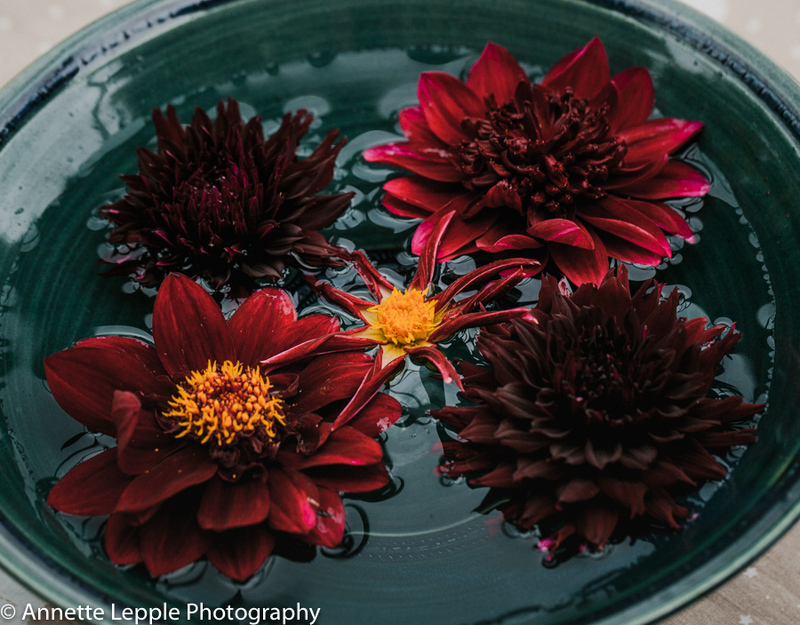 Wow I love all the blooms and my goodness the colors….perfection floating the dahlias! Oh you have got me singing Annette even though it’s been a few years now since I experienced manic Mondays. What lovely glowing October favourites. The dahlias look as if they could float there happily for a long time to come. Those rich reds floating in the dish are so lovely. Autumn seems in its glory at your garden. Have a fine week. The dahlias are lovely Annette! What’s that spidery one in the middle? Thanks also for your Sept/Oct favourites! We have had a wet, wet, wet summer! How strange that it’s passed you by. I still get outside, but boots are often very, very muddy when going in again! Hi Cathy, lovely to see you. Yes, I’ve heard about the wet summer in the North. It’s crazy really. October has been the dryest since we came. The dahlia is from the Honka-series: Honka Tahoma Moonshot. Oh what a name! It’s a pretty series worth checking out. Thanks Annette – googled that. I do like dahlias that have some delicacy about them. ‚Promesse des Fleurs‘ and Sarah Raven seem to supply, that’s good! Inspiration again from you! Ordered of them before but quality isn’t always great, in case of bulbs less of a problem though. einfach so ganz die Annette! Wunderschön! Wow, Annette! ven without rain, your flowers are lovely. And the pumpkins too. Sorry about the dried-out pond. That’s not good. I remember the drought one summer that almost dried out our streambed — it was a sad sight. thanks for posting during a busy time! deine Bilder sind wundervoll. Viele deiner Favouriten wachsen auch in meinem Garten in Berlin. Leider war bei uns der Sommer doch sehr verregnet und viele Pflanzen haben sehr gelitten unter der Nässe. Jetzt hoffen wir auf die nächste Saison. Vielen Dank für den netten Kommentar und das Reinschauen, Theresa, das mit dem Regen ist offensichtlich nicht gerecht verteilt 😉 Frohes Gärtnern!